LEGO’s Chima and Ninjago series on network television set the bar for quality entertainment which is not only funny but also engaging. These protagonists often dealt with inadequacies and skeletons in the closet. To resolve these issues took several episodes and for them to unlock their hidden potential meant achieving balance with the Force. 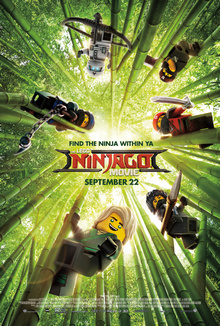 In Ninjago: Masters of Spinjitzu, Sensei Wu achieved this harmony many years ago and this new movie does little to align inner peace (the virtues of patience and spirituality) inside an action comedy. After watching the LEGO Ninjago Movie, I’m wondering what in blue blazes happened? Comparisons by people who know the small screen counterpart will no doubt be made. These viewers (especially me) who kept up with this version for the past seven years will be picking favourites. Even though I knew the film would not be a continuation by any means after watching the trailer, I had hoped it can still be good. Like LEGO, new builds can be cobbled together from various kits, but this one is unbalanced. The only nod to the show is in the music the lead protagonist, Lloyd Garmadon (voiced by Dave Franco), has as a ringtone. Other than using some information established in the playsets when this universe was first released, all other facts are ignored. I hoped for a different look in the relationship Nya has with Jay (season six of the television series will tug at the heartstrings) and how Lord Garmadon (Justin Theroux) came into power (seasons one to five give more back story than this movie ever will). They are also now all the same age and going to high school together! The latter I do not mind. I’m also thankful that the song Kung Fu Fighting is not used; Ninjas practice Ninjutsu! I’m not sure if there’s a committee overseeing the production much like how the story continuity in Star Wars is managed. This film feels very uneven. No amount of deconstructing and rebuilding the narrative and action sequences can save it. If this movie only had the Hageman brothers writing, I might not be as harsh. They did no wrong in the Spinjitzu series and somehow, somewhere, the visions between six screenwriters did not gel. Seven wrote the story. Three directors are credited; one was responsible for the live-action segments and the others assigned to handle the animated parts. The overlay to which the story of Lloyd emerges from is far more exciting than the animated bits. Mr Liu (played by an always charming Jackie Chan) is a fitting storyteller, offering a kid who decided to hide in his curious goods shop some life lessons in his story about Sensei Wu helping the Green Ninja out. Some of which hits too hard like a brick upside the head.